Detective DD Warren has seen and done a lot during her career on the Boston police force, but she’s never had to solve a murder that hasn’t even happened yet. While on the trail of someone killing internet predators, Warren is confronted outside the latest crime scene by a young woman who adamantly believes she only has four days left to live. Why? Because her two childhood best friends have been killed on that very day, at the very same time, the past two years. With no signs of struggle, no forced entry. A killer managed to get up and close and personal, end their lives, and get away scot-free. Leaving no trace, and with no apparent motive. The inseparable trio from the New England small town is now down to one, and Charlene Rosalind Carter Grant has no doubt her own time is running out. On January 21, at 8pm, she will die, and ‘Charlie’ wants Boston’s best detective to investigate her imminent death, to find out what’s really been going on, and to catch her killer. But are Charlie’s worries real? And what was she doing hanging around the scene of another crime? Has the small town police dispatcher decided to get a little vigilantism in during what she thinks will be her final days? She’s certainly been preparing herself for battle – learning to outshoot, outfight, and outrun almost anyone. And she knows about police work. Is she using those skills to gun down the paedophiles, is she the one handing out some street justice, taking the law into her own hands? DD Warren doesn’t quite know what to think about Charlie, but finds herself swept up in the other woman’s struggles, while still juggling her own, at work and home. The former workaholic is now a mother to a 10-week-old baby, living with her partner Alex (who is also in law enforcement), and actually enjoying getting away from work now and then. But her investigative drive still burns bright. After a creepy prologue describing two young girls being woken then terrified by their clearly mentally unstable mother, Catch Me is told from the alternating perspectives of the two female leads – both strong, complex women, with distinct outlooks. But this terrific thriller is also packed with plenty of other interesting and layered characters, and flashes of insight into wider human desires, fears, and more. 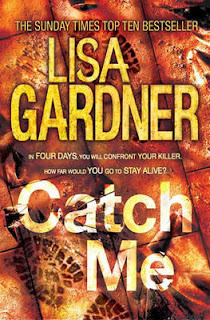 Like the very best crime thrillers, Catch Me doesn’t just entertain with a gripping plotline or intriguing mystery, it emotionally engages the reader. We don’t just want to know what happens; we care about the fully rounded characters. We feel as we read. Gardner also raises interesting questions about a number of wider issues, including the frightening ease with which internet predators can contact and groom children, and how parents can protect – or fail to protect – their children. Catch Me is arguably Gardner’s very best novel yet; an engaging and emotionally tense page-turner that hooks you early and doesn’t let go. Right to the thrilling end. Craig - Thanks for the fine review. It sounds like there some interesting and complex characters here, which I always appreciate.